The research of lightness has been a constant that has always accompanied our path over time, as lightness expresses the key concept to optimize energy and matter, indispensable and superfluous. The search for lightness obliges us to constantly explore the market in search of innovative materials to harmonize with each other, for the creation of new shapes and ever more fascinating objects: delicate shapes, subtle structural grids that support equally light casings. The dry construction systems complete the lightness and charm making the buildings eco-sustainable and more performant from the energy point of view, with the creation of different functional layers and the use of components mechanically assembled on site, without the use of any wet binder (mortar, glue, cement, etc.). These technological choices allow buildings to be built that meet the most stringent energy, seismic and weather requirements, as required by the latest regulations. Steel Pool Cantieri proposes itself on the Italian and international market as a company able to design and manufacture high quality metal claddings with customized solutions developed on request by the client and, therefore, on a specific project. Strong of its twenty years of experience, Steel Pool Cantieri guarantees high aesthetic and functional values, making the most of existing buildings or new buildings. All the realizations are carried out through a state-of-the-art technical development and subsequent implementation applying the various top-quality products available on the contemporary market and employing highly qualified personnel, with 5 stars installer certificate for all the noble metals used in modern architecture, claddings, such as RHEINZINK titanium zinc, PREFA aluminum, KME TECU copper and ROOFINOX stainless steel. Steel Pool Cantieri has a vast experience also in the use of ALUCOBOND and STACBOND aluminum composite panels, HPL TRESPA panels, trapezoidal and corrugated profiles MONTANA as well as for all the best European brands among the producers of roofing systems and metal facades such as KALZIP and RIVERCLACK. Always projected towards the future, Steel Pool Cantieri is specialized in dry construction and in all the modern concepts on which a modern, sustainable and certified construction is based, able to fully meet the earthquake regulations, as well as the need for noise reduction. and energy containment. Steel Pool Cantieri collaborates with the best leading manufacturers in Europe of metals applied in civil and industrial architecture and develops technical-architectural solutions to customize to better satisfy its customers. 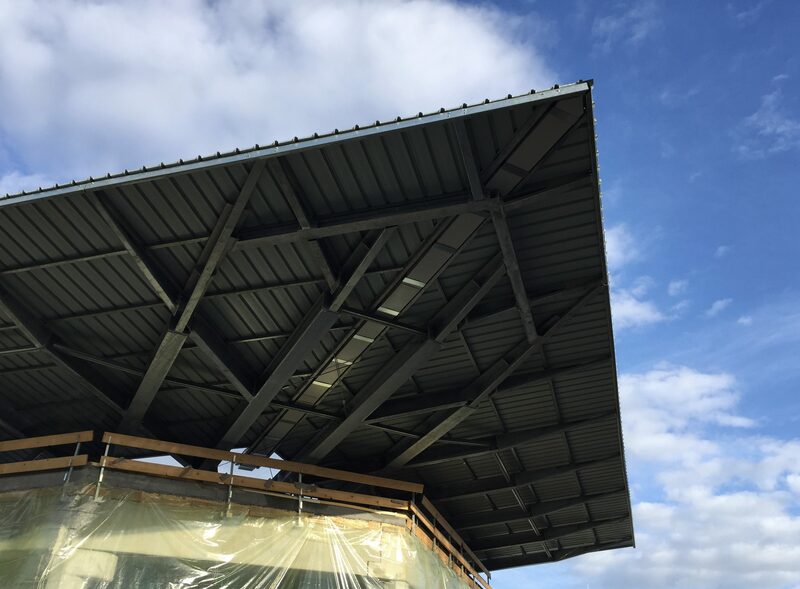 The choice of metal as a covering of façades and roofs, makes it possible to create fascinating, ecologically sustainable, functional and long-lasting works. Brands such as Kalzip, Prefa, Tecu, Rheinzink, Vm Zinc are synonymous with quality and reliability at the highest levels for the metal world. In the composition of claddings in contemporary architecture, high importance is also given to polycarbonates to create transparencies and plays of color; Steel Pool Cantieri has long established a solid partnership with Dott. Gallina, one of the world’s leading manufacturers in the sector.